Hmm half year of 2015 was gone. I almost forget what targets I set at the beginning of the year. Have to review back then only I realized that some objectives are still far off from the targets. For Puncak, I was buying for short term. Hopefully the agreement can be settled by July and the share price up a bit. For Opensys, I purchased it due to its improved performance. Have to keep on monitor its quarter reports moving forward to keep track on its CRM sales as well as its recurring income. Have to sell it off if the growth was not up to the standard. 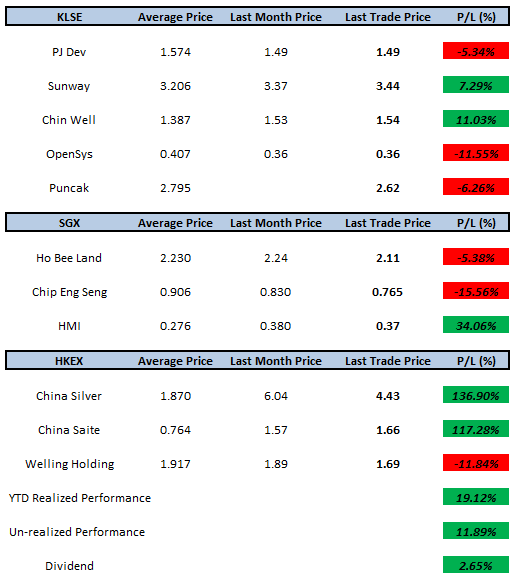 For SGX, nothing much changes for the 3 stocks. All have to wait for quarter report release in coming August. Not much news regarding the sale of Mahkota Hospital anymore for HMI. For HKEX, I already cut half of my holding in China Silver, so probably will just sit back and let's see how far can it go to. Will probably do the same on China Saite, but feel like it's not the right time yet. I still looking for companies to invest especially in HKEX. But still can't find any company ngam sam sui. Have to keep on screening the companies.